Q: What is your title/role? A: I am a Student Manager at the Starbucks on Maple Street. A: Yes, I am a certified barista through Starbucks. But as a Student Manager, I’m also in charge of delegating tasks, pulling sandwiches and pastries, that kind of stuff. Q: What is your background like? Major, tc. A: I grew up in Urbana, Ohio, in a super small farm town. I’m a major in Communications and Photography so I’m a very visual person. Working at Starbucks has allowed me to use some of my visual and artistic skills to work with marketing and advertising for the store. Q: How did you get into the food service? Did you have prior experience? A: I had no prior experience before coming to college. I worked as a camp counselor and I worked picking berries but never actually in food service. Freshman year I worked at Garden Commons for a semester and then I came to Starbucks and have been here for the last year and a half. Q: What is the most exciting part of the job? A: The time goes very quickly when there’s a line out the door. It’s exciting to just be able to move from one cup to another, and once you get in a rhythm you can just go. A: Working in such a stressful environment in such small quarters kind of forces us to get to know each other and learn how to work with each other. This has allowed me to not only meet incredible people, but also to form friendships that I wouldn’t have otherwise found. Q: How would you describe your relationship with guests? A: When guests are nice, it makes your day. When they come in, ask you how you are and are very friendly it makes your day. Sometimes, people can get frustrated when we’re busy, but we just offer the best customer support we can and keep the drinks moving. Q: How would you describe yourself personally? Hobbies? Interests? A: Well my roommate has a dog, so I love to play with her. I’m also super outdoorsy. I love to hike, camp, kayak, all that. I’m very artistic; I love to do photography, paint, do crafts. Mostly I just love to be outside. Q: What is one thing not many people know about you? A: People know this once they get to know me, but I’m wildly optimistic. I find the good in literally everything. Q: What is your favorite drink to prepare? What is your favorite drink to drink? A: My favorite drink to prepare is the Starbucks Double Shot. It’s just ice and espresso. You shake it up real well, pour it in a cup and top it with milk. Once you top it off with milk, it’s all swirly and really pretty, so it’s fun to make. My favorite drink to drink is the London Fog Latte, which is Earl Grey Tea, and I like to put soy milk in it. Some people say it tastes like Froot Loops, but I think it’s really good. It’s a nice comforting tea drink. A: I love The Office and New Girl. Again, I’m incredibly optimistic, so anything that’s a happy sitcom. Any comedies are usually my cup of tea. …haha I didn’t mean to make that pun. Q: What have you learned so far from Starbucks? A: I’ve learned how to be more patient and how to handle a lot of stress. We can have a lineup of probably fifty cups and I no longer get stressed about it. It just pushes me to go a little faster, so my time management has definitely been improved. 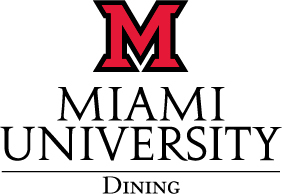 Q: Any advice for applying/working for Miami University Dining? A: Since I’ve mostly worked in Starbucks, which kind of feels like it’s own separate branch, I can’t give a ton of advice, but I would recommend it. I’ve enjoyed my time here and I plan to work here until graduation. Once you start, you usually end up meeting some pretty cool customers and you work with some great people. So having that experience has been a good one that’s taught me a lot. A: We’d love for you to come to Starbucks, but be patient and friendly. You’ll get a great drink and a great interaction.